I had the great pleasure of once again being in…well…I was in New Jersey…but the pleasure was not in being in the Garden State but rather being in Woodland Park at America’s Urban Defense Institute and soon to be largest gun range in the country, Gun For Hire. 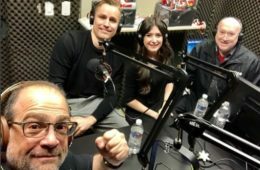 I just so happened to be in the neighborhood covering the Young Americans for Liberty Summit and as fortune would have it was available to do a radio interview with the larger than life founder of Gun For Hire, Anthony Colandro and his self described “classical liberal” co-host Sandy Berardi. As much as I enjoy a couple of guys sitting around talking guns and deconstructing the leftist progressive plague that is infecting this country, I thought that a better show might include political firebrand, verbal stomper of Nazis, founder of Lone Conservative and all around gem in the Conservative movement, Kassy Dillon. Kassy was also in the area for the aforementioned Summit and I reached out with an invite that she was happy to accept. While I have been to Gun for Hire before Kassy had not, so Anthony took us on the tour showing us the different range options, rental selection and gun shop before explaining that the expansion they are currently undergoing will make Gun for Hire the largest gun range in America. Note: I fully intend to return in the summer when the expansion is completed and do a full review of this island of rationality in the otherwise gun control deranged sea that is New Jersey. Walking through Gun for Hire you see a true crosscut of America and an exemplification that the right to keep and bear arms know’s no color, religion, creed or bias. While the false stereotype that gun owners and enthusiasts are a bunch of old, fat, white guys exists…the truth of the matter can be found in the shooting stalls of Gun for Hire that more resembles a gathering of the UN then it does a 1975 Elks Lodge meeting. After the tour Kassy and I, along with a third guest Jim DeJulio made our way into the studio. No need to summarize the interview since I have it, in it’s entirety below and it’s a good one. We cover the cost in life that so called gun free zones are responsible for, what the Left is really after, how it is to be a lone voice of reason in an academic world gone made and more. I will bring this up though, during the breaks and a little on air Anthony was discussing the defensive pen that he carries and its many uses. The pen itself is fantastic but for some reason he kept using me as his practice dummy MUCH to the giddy delight of one Kassy Dillon…suspect. But in all seriousness, the pen is a pretty amazing self defense tool and in many places where a person is denied more traditional means of self defense it is definitely an option. Needs must when the Devil drives and in states like New Jersey where you have a Governor like Murphy who vows to make Jersey the California of the East, he’s cracking Hell’s whip with demonic glee. Hope you enjoyed it. I encourage all my readers, especially those with children either in college or who will one day head there to start following Kassy and Lone Conservative as she and it are great resources in helping your child navigate through the hostile academic environment that many young conservatives face. Once again, if you live anywhere near Woodland Park New Jersey and you like guns, or you are curious about shooting, you are doing yourself a disservice if you don’t go check out Gun for Hire. Trust me, it’s worth the trip.